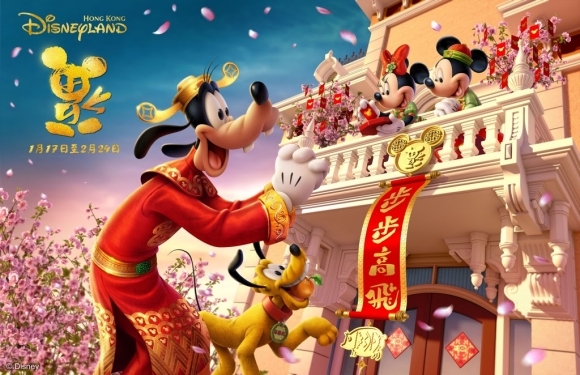 Hong Kong Disneyland Resort (HKDL) will be celebrating the Year of the Pig from now to February 24, 2019. Step into the park filled with Chinese New Year decorations along Main Street, U.S.A. and enjoy a truly impressive array of new seasonal meals and gifts to shop from. To ring in the Year of the Pig, the Three Little Pigs, together with Mickey Mouse and Friends in their brand new Chinese New Year outfits, will appear around the park to spread warm new year wishes to guests. Do not forget to participate in the “God of Fortune Goofy Celebration Moment” to receive some extra good luck. Also, guests visiting from February 5 to 9 will enjoy extra blessings upon entering the theme park when they are presented with a newly designed Lai See packet. Travel trade partners around the region are presenting attractive tour packages from now till March 31, 2019, offering superior value for money for a vibrant multi-day vacation at HKDL. For a fulfilling start of Chinese New Year, guests should gather their fortune at the entrance of HKDL with a newly designed Lai See. These special red packets will be distributed to guests during the first five days of Chinese New Year, from February 5 to 9, while stock lasts. Each red packet includes a delicious chocolate gold coin as well as a merchandise, food and beverage coupon, and guests can share the good fortune with holiday gifts. Guests may also immerse themselves in the spirit of Chinese New Year as seasonal décor touches of gorgeous flowers and shimmering lanterns around the park bring prosperity and good fortune for the year ahead. To wish guests an auspicious New Year filled with good fortune and happiness, Mickey Mouse, Minnie Mouse, Donald, Daisy, Goofy, Chip ’n' Dale, Duffy, ShellieMay, StellaLou and Gelatoni are waiting to meet guests at Main Street, U.S.A. in their brand new Chinese New Year outfits. Their newest friend Cookie is also joining for the first time, wearing her glimmering Chinese New Year attire. And that is not all — performers dressed in traditional Chinese outfits will appear around the park, bringing surprises and delivering happy New Year wishes to all! HKDL offers delicious dining choices for family gatherings. At Studio Lounge, guests can try out an assortment of delicacies in the “Chinese New Year Platter” or its special “Lo Hei”, which stands for good luck and prosperity. Hollywood & Dine is also offering the new “Mini Treasure Pot” for you to be blessed during the year. In Crystal Lotus, indulge in the “Everything Goes Well Dinner Set” which comes in nine dishes for some long-lasting good fortune or gather some good luck for guests with the “Golden House” set menu at World of Color Restaurant. Shop for all-new Duffy and Friends plush toys, key chains, bags and Tsum Tsum in traditional Chinese outfits featuring silky red and green with colorful floral patterns that symbolize the festive spirit! Guests can also find Cookie-themed merchandise items in traditional Chinese outfits for the first time ever. Guests are invited to extend the magic of Chinese New Year with a stay at one of the themed resort hotels. Enjoy a complimentary in-room festive overlay in all three hotels and take part in inspirational Chinese traditions through family-friendly hotel activities, including the Feb 5-only Disney Lion Dance tour and Chinese New Year Choir across the three hotels during the first three days of the lunar new year, as well as the Disney Traditional New Year Market, which will be organized throughout the holiday season. After enjoying their time in the park, lovebirds can pamper their significant other with a romantic Valentine’s Day dinner at Studio Lounge, Walt’s Cafe or World of Color Restaurant. It’s the perfect way to celebrate a romantic Valentine’s Day together at HKDL. Travel industry partners in Asia are offering attractive packages for visitors to experience multi-day HKDL Chinese New Year experiences. A PLAY & SHOP 2-Day Special Package is available for booking through regional travel trade partners. It includes one 2-Day admission ticket and 2 merchandise discount vouchers of HK$15 each. 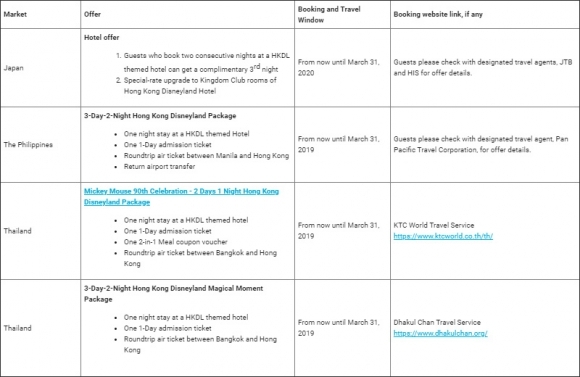 Cathay Pacific Airways (CX) is presenting a CX Magic-in-The-Air package inclusive of return flights on CX, one-night stay at a HKDL themed hotel and one 2-Day admission ticket. The offer is available from now to March 31, 2019, for visitors from Australia, Indonesia, Japan, Korea, the Philippines, Singapore and Thailand.